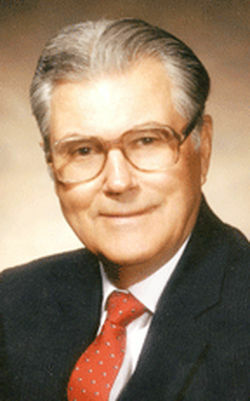 Melvin Hermanson, 96, died Sunday, June 5, 2011, in Rapid City, S.D. 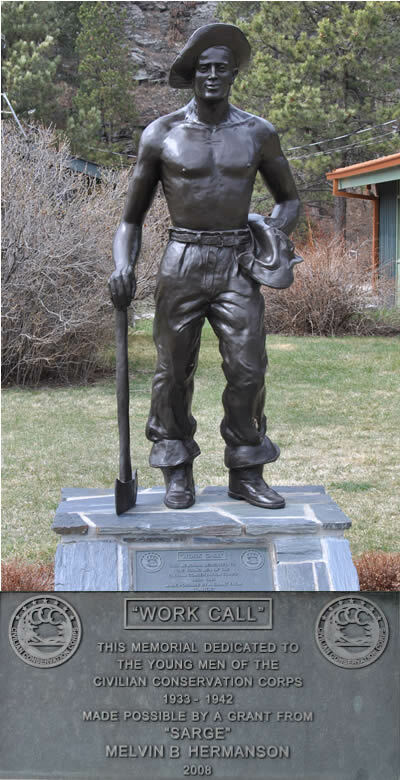 It was Hermanson, a former Civilian Conservation Corps (CCC) recruit, who donated the $20,000 to provide for a life-size bronze figure of a CCC laborer, stripped to the waist and showing the rigors of his work, to be placed at the new Hill City Visitor's Center (VIC). Hermanson knew about the lifestyle and what a contribution these young men made, because he was one of them. During the height of the Great Depression, there was little work and no money among most families in America. On March 3, 1933, the Emergency Conservation Work Act was signed into law for males from 18 to 25 years old. They worked across the United States, staying labor camps where they earned, on average, $15 per month. Of this amount, $10 was to be sent home to help the family finances and $5 could be kept by the worker. One of the first to enroll from this area was 18-year-old Melvin Hermanson. The statue was executed by the Elliot Ganz foundry in New York in an edition of 42 that have been or are being placed around the nation to honor these workers and their many contributions to the country's infrastructure. Each is mounted permanently on a base of rock native to the area in which it is erected. In western South Dakota, CCC workers were instrumental in building roads, dams, fences, ponds and drainage ditches and much of the early construction on places that encouraged early tourism, including the pigtail bridges, picnic and camping areas, signage and decorative rock work. They also helped fight forest fires and aided in other natural disasters. Several camps were constructed near Hill City and in addition to an original barracks located on the VIC property, a cluster of buildings utilized for decades by the Black Hills Playhouse in Custer State Park were also a headquarters for CCC workers. Melvin Hermanson was born March 30, 1915, to Marie and Lewis Hermanson in Brookings, S. D. He attended school through eighth grade and worked on the family farm before enrolling in the CCC, being stationed first at Rochford and later at Camp Fechner, at the edge of Fort Meade. His obituary stated that he cherished the memories of this time throughout his adult life. In 1939, he married Marthleen "Marty" Horton. In 1940, before the start of World War II, they purchased a building on Mount Rushmore Road which became Hermanson's Food Market and operated it for 40 years at the same location. During this time, Hermanson was also involved in other local business ventures and golfed and gardened into his 90s. He is survived by two sons, Paul Hermanson of Phoenix, Ariz., and Gary Hermanson, Rapid City, several grandchildren and great-grandchildren. Services were held June 11 at Trinity Lutheran Church, Rapid City.